iTunes is getting long in the tooth. The interface hasn’t changed in years. Yes, there have been some cosmetic changes here and there and lots of cool and useful features added, but in general, it’s looked and acted the same for many years. I am mostly ok with that, as I’ve learned how to navigate around my music and videos and can make things work for me very easily. I wouldn’t mind seeing some changes, though. Streaming and subscription service – We already have last.fm as a decent site for streaming and music discussion. The previous lala site was purchased by Apple. The inevitable would be to see some sort of offering from Apple. 90 Second Song Previews – This would be nice for quite a few songs that need more than the 30 seconds currently available. Remove DRM from videos – Hey, a boy can dream, can’t he? They did it for music, maybe someday, our video purchases will be liberated, too. None of the above came true. It was the Fab Four that are now on iTunes for the big news this morning. I celebrated at 7:58am and purchased “Happiness Is A Warm Gun” from The White Album. This is big news since any change in the types of media that music is offered on, getting The Beatles onto that new format is a labor of negotiations, licensing and all sorts of back and forth talks to work it all out. 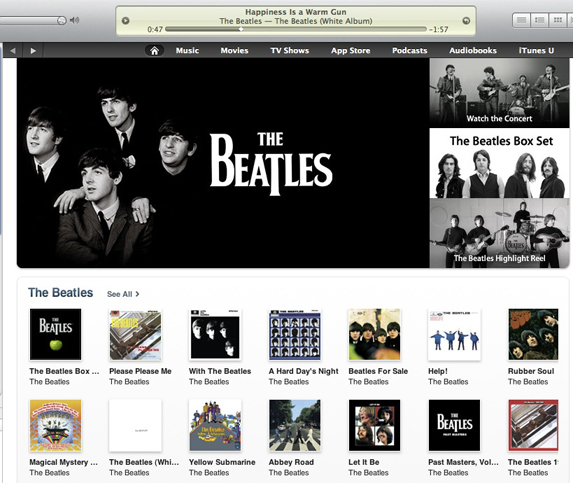 So love them or hate them, The Beatles on iTunes is an important step in the world of music. As for my other wishes for changes to iTunes, I guess we’ll wait for future announcements and events. I don’t like the Beatles, so this seems like kind of a lame announcement to me. Seems like a lot of buildup for something so… regular, really. Yeah I have to say I was totally underwhelmed by this. I already have the albums on CD and ripped them years ago. Still, I’m sure there are people out there who don’t own anything by The Beatles and this is truly a big announcement. Underwhelmed says it right. It’s more about the exposure than anything, as you said. I’ve already ripped a good amount of the Beatles CDs I do have. The Beatles … on Apple. There’s some sort of circle of life thing here. You have your details right. Apple Computer (now known as simply Apple Inc.) has had a few legal tangles with Apple Corp (the record company) over the years, starting in 1978. Like you said, it’s about time. I do need more Beatles in my collection. Not sure how much I’ll buy via iTunes, though. That song makes me want to watch Accross the Universe. Is it just me or is iTunes really slow? I just updated it this weekend and it still takes forever! My computer is fast with everything else! iTunes has been slow lately, and I’m sure today, it’s very slow. I noticed that when I did the upgrade from iTunes 9 to iTunes 10, my iPhone and iPad syncs got faster.